Last Thursday, July 23rd, the Chesapeake Bay Executive Council met in Washington, D.C. to discuss progress, setbacks, and initiatives going forward for restoration of the Bay. The Executive Council is made up of governors from all Bay states and the Mayor of D.C., as well as heads of relevant federal agencies. Present at Thursday’s meeting were: Virginia Governor Terry McAuliffe (the Executive Council Chair); D.C. Mayor Muriel Bowser; Maryland Lieutenant Governor Boyd Rutherford*; Pennsylvania’s Secretary of the Department of Environmental Protection, John Quigley*; and Delaware’s Secretary of the Department of Agriculture, Ed Kee. Also present were heads of various agencies: Administrator of the EPA, Gina McCarthy; Deputy Assistant Secretary of Fish, Wildlife and Parks in the Department of the Interior, Karen Hyun; Assistant Chief of the Natural Resources Conservation Services in the U.S. Department of Agriculture, Kirk Hamlin; and Chairman of the Chesapeake Bay Commission, L. Scott Lingamfelter. The public meeting began with an introduction from Chesapeake Bay Program Director Nick DiPasquale. He mentioned the interconnectedness of all species and habitats in the Bay watershed, and the need for multi-state partnerships to protect and restore the Bay. Following his presentation, the Executive Council panel made brief comments on what had been discussed at the earlier private lunch. A short Q&A session from the press ended the meeting. Most of the meeting was spent by council members reassuring the public that a lot of progress had been made to clean up the Chesapeake Bay, and that a lot more progress was required. However, a few specific initiatives were mentioned that shed some light on how restoration efforts might progress in the years to come. The Council mentioned a riparian forest buffer resolution, and the need for partner states to increase compliance and enforcement among farmers to install riparian buffer zones along waterways. Going off of this, Chesapeake Bay Commission Chair, Lingamfelter, discussed livestock stream exclusion. While many Bay states, such as Virginia, have a majority of their farmers participating in livestock stream exclusion, there is still more to be done in the watershed. Lingamfelter calls for greater USDA support and outlined five actions he recommended to the Secretary of the USDA to ensure livestock stream exclusion is enforced throughout the watershed. These actions include educating farmers, increasing technical and financial assistance for fencing or riparian buffers, and making requirements more clear, and more of a priority. The issue of funding restoration efforts came up several times during the meeting. Governor McAuliffe announced an increase in federal funding. The current Presidential Budget allocates $39.7 million, pending congressional approval, toward conservation and restoration in the Chesapeake Bay watershed, while the previous fiscal year allocated only $7.58 million. Maryland Lt. Governor Rutherford suggested creating more public-private partnerships to increase funding from the private sector. He mentioned a resolution to sponsor a symposium by the Bay and federal partners to further discuss this idea. The panel ended with EPA Administrator McCarthy and Virginia Governor McAuliffe highlighting where more efforts need to be made, such as urban stormwater runoff and agriculture, and the need for Bay states and partners to share their best practices with each other to improve water quality throughout the watershed. This meeting was the first for many Executive Council members who had been newly elected as representatives for their states or cities in 2014. This excuse was used to explain why timetables for the next two-year milestone (2015-2017) were yet to be released. (Milestones are due to come in to the EPA in mid-January of 2016). While more specifics on timeframes and restoration plans would have been appropriate, the meeting did provide some insight on what Bay states will be focusing on over the next couple of years to improve the health of the Chesapeake Bay. This entry was posted in Maryland, Policy, Virginia and tagged Chesapeake Bay Executive Council. As Katie pointed out in a previous post, some restaurants in the Washington area were reporting a shortage of crabs. When I was down at our house on Antipoison Creek, I stopped by to see Glenn, one of the local crabbers, to see how many crabs he was catching. 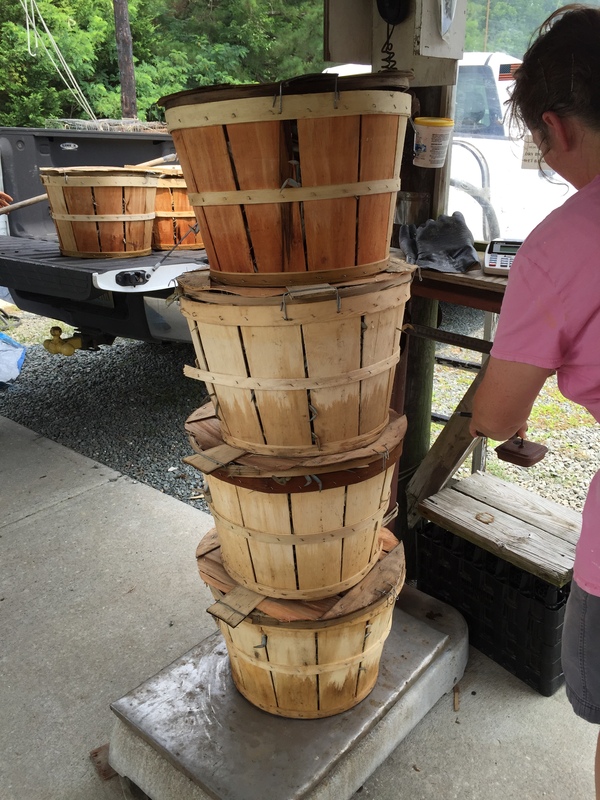 On July 2, Glenn brought in nine bushels of crabs from more than 150 pots. He considered that a good day, and said he had had a pretty good June as well. I rode with him as he delivered the crabs to his buyer and then picked up bait for his next trip out. Glenn had four bushels of #1s, three bushels of #2 and 2 bushels of #3 crabs. The first picture shows the buyer weighing the four bushels of #1 jimmy crabs. Each bushel is marked as to the type of crab it contains. #1 are mature jimmy (male) crabs. These are often sold intact for steamed crabs. #2 jimmy crabs are younger male crabs, probably used for crabmeat. The #3 crabs are mature sooks (females). The price paid for a bushel depends on the type of crab, as well as the time of year and market. The buyer was waiting for one more waterman to drop off his crabs, and then he would load the day’s catch into a refrigerated truck to take to the Little River Seafood processing plant up in Reedville. After the bushels were weighed, Glenn picked up nine empty baskets, and we headed back to White Stone to pick up bait at a local fish warehouse. 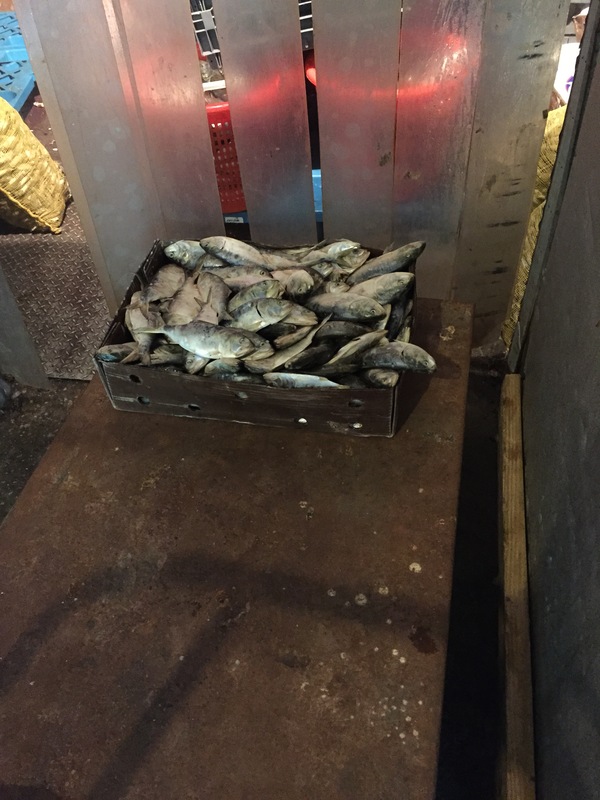 Glenn uses menhaden to bait his crab pots, and we picked up five 50-pound boxes of frozen menhaden. We stored those in an insulated box on the dock, ready to be loaded on the boat for the next trip out. Buddy, the blue heron that hangs out at Glenn’s fish house talked us into giving him one of the menhaden, which he promptly stabbed with his beak. Weighing #1 crabs harvested from the pots that morning. Frozen menhaden headed for crab pots as bait. This entry was posted in Blue Crabs, Virginia. Given the EPA’s recent interim assessment of the Bay States’ ongoing implementation of the Chesapeake Bay TMDL and the Third Circuit’s affirmation of the legality of the Bay TMDL, it is worthwhile to take a closer look at the findings of Virginia’s water quality assessment. While this assessment is relevant to the Chesapeake Bay TMDL, in that any sub-watersheds belonging to the Chesapeake watershed apply to the Bay TMDL, it encompasses all of the waterbodies in Virginia- not only those belonging to the Bay watershed. Virginia may be on track towards Bay TMDL implementation, but current water quality in the state is still far from healthy. According to Virginia’s Department of Environmental Quality (“DEQ”) 2014 water quality assessment, a significant percentage of rivers, lakes, and estuaries are “impaired” in three out of the six designated uses in Virginia: recreation, aquatic life, and fish consumption. The assessment sites the presence of E. Coli from agriculture, urban runoff, leaking sanitary and storm sewers, and domesticated animals as primarily responsible for the impairment of the recreation use. For aquatic life, low levels of dissolved oxygen concentration and nutrient enrichment are the primary cause of impairment. Specific causes for impairment of fish consumption are mercury and PCBs (polychlorinated biphenyls). The remaining designated uses are shellfishing, public water supply, and wildlife, which have a much lower percentage of impaired waterbodies. Additionally, a vast majority of lakes (81%) and estuarine waters (75%) tested are impaired for at least one designated use. River waters have a lower percentage of impairment (17%), but this figure does not take into account the 78% categorized as non-assessed due to insufficient data. DEQ utilizes two methods of data collection: DEQ-approved monitoring, which includes all monitoring performed by DEQ or individuals approved by DEQ, and lower quality, DEQ-non-approved monitoring, which includes outside data collection by citizen groups, the private sector, and other government organizations. Both types of monitoring play an important role in DEQ’s overall assessment methodology (p. 4). It is not clear from the report, however, why so much data for river waters are insufficient to assess. The VA DEQ 2104 assessment is based on six years of monitoring between 2007 and 2012. The Clean Water Act requires every state to submit to the EPA a biennial review describing the quality of their navigable waters. Virginia uses a monitoring schedule that covers 1/3 of all waters every two years, so that all waters are monitored within a six-year period. Unlike the EPA interim assessment, however, this water quality assessment provides a more accurate and immediate sense of what the Virginia’s water quality was in 2012. As the information in this report shows, despite Virginia staying on track for the most part to meet the Bay TMDL implementation targets, there is still a long way to go and a lot that needs to be done for the water quality to actually improve. One of the biggest areas for improvement is monitoring. As stated earlier, almost 80% of river waters throughout the state are categorized as “non-assessed” due to lack of sufficient data. As a result, it is uncertain what percentage of these rivers are meeting their respective water quality standards, and what percentage are impaired or threatened. Unfortunately, a lack of sufficient monitoring- a problem which exists in most states- is more easily fixable in theory than in practice: understaffing at the agencies charged with conducting the water quality assessments as well as budgetary constraints severely limit the amount of waters that can be properly assessed. One potential way in which monitoring can improve is through Virginia’s citizen monitoring programs. DEQ relies on citizen monitoring data to supplement its own data collection, and offers grant money to organizations through the state’s Citizen Water Quality Monitoring Grant Program. While DEQ cites 120 such organizations as providing data for the current assessment, not all data collected could be used because they did not meet DEQ’s assessment methodolgy or procedures. If more citizen-collected data could be used by DEQ, through additional citizen involvement and proper training, more waterbodies could be assessed, which would lead to more accurate assessments of water quality and more accurate changes to address water quality conditions. Improved monitoring may not directly address other issues plaguing water quality, such as excessive bacteria or nutrient enrichment, but with more accurate assessments, Virginia can more effectively manage its regulatory framework to achieve greater reductions in pollution and better meet the goals of the Clean Water Act and Bay TMDL. The information in this post was acquired from the report available on VA DEQ’s website: http://www.deq.state.va.us/Programs/Water/WaterQualityInformationTMDLs/WaterQualityAssessments/2014305(b)303(d)IntegratedReport.aspx#factsheets. This entry was posted in Virginia and tagged Chesapeake Bay, water quality. Earlier this month, the Court of Appeals for the Third Circuit upheld the legality of the Chesapeake Bay TMDL, securing the EPA and Bay States’ authority to continue with implementation of the Bay TMDL throughout the Chesapeake Bay watershed. This long awaited decision- oral arguments were held in November 2014- is huge news for the Bay community. The case involved a challenge to the Bay TMDL from within the agricultural community and the governments of 21 states. At issue in this case was the statutory interpretation of the term “total maximum daily load” as used under the Clean Water Act. A total maximum daily load (or “TMDL”) is a document created whenever a waterbody is classified as “impaired” under the Clean Water Act. The document identifies the amounts of various pollutants that can be safely absorbed by that waterbody. The Bay TMDL, in particular, is one of the most detailed and comprehensive TMDLs that the EPA has written. The challengers argued that use of the word “total” meant that the EPA could only prescribe a single, total amount of a pollutant that a waterbody could healthily absorb, and that, therefore, the EPA exceeded its authority when it created the Bay TMDL with the level of specificity it contains and the various accountability mechanisms it enforces. The Bay TMDL includes, in addition to totals of pollutants, timelines for compliance, requirements that the Bay States provide reasonable assurances that certain practices will be implemented on time, and “backstop” measures which the EPA will enforce if states do not remain on track. The challengers maintained that the EPA went beyond its authority, and that such authority belongs to the states. The EPA and other environmental organizations supporting the Bay TMDL countered that the EPA’s interpretation is a lawful exercise of its delegated authority. In its decision the court found in favor of the EPA on all points, relying on a judicial doctrine commonly known as Chevron deference (after the seminal 1972 Supreme Court case Chevron v. Natural Resources Defense Council). That doctrine states that where Congress delegates an agency to implement a law, and Congress’s intent is unclear as to a provision of that law, a court must give deference to the agency’s lawful interpretation, so long as that interpretation is reasonable. In other words, if a statute is ambiguous an agency may apply its own interpretation as long as it is a reasonable one. In this case, the court held that the Clean Water Act does not define the phrase “total maximum daily load,” and that “[e]stablishing a comprehensive, watershed-wide TMDL—complete with allocations among different kinds of sources, a timetable, and reasonable assurance that it will actually be implemented—is reasonable and reflects a legitimate policy choice by the agency in administering a less-than-clear statute.” (Court’s decision pp. 59-60). The court also addressed broader concerns about this case, namely the balance of power between the Federal and state governments. This case carries significance outside the Bay area because the EPA is likely to begin a similar TMDL process for other large watersheds in the country, such as the Mississippi River. It is because of this that so many state governments intervened in this case to challenge the Bay TMDL. But as the court acknowledged in its conclusion, “Congress made a judgment in the Clean Water Act that the states and the EPA could, working together, best allocate the benefits and burdens of lowering pollution. The Chesapeake Bay TMDL will require sacrifice by many, but that is a consequence of the tremendous effort it will take to restore health to the Bay—to make it once again a part of our “land of living,” Robert Frost, The Gift Outright line 10—a goal our elected representatives have repeatedly endorsed.” (Court’s decision p. 60). This are powerful words coming from a Court of Appeals, and provide an sense of optimism as the Bay States gear up for Phase III of the Bay TMDL in 2017. This case was an appeal from a 2013 decision in which the lower federal district court initially upheld the legality of the Bay TMDL. The Richmond Circuit Court judge who heard the Chesapeake Bay Foundation (CBF) vs. Virginia lawsuit earlier this month has ruled against CBF’s plea to keep livestock out of state streams and rivers. The decision allows large livestock farmers, particularly cattle farmers, to give animals unfettered access to Chesapeake Bay tributaries. Virginia has pledged to institute Best Management Practices (BMPs), including the use of stream buffers and fences on farmlands, to reduce nutrient and sediment loads to the Bay. This ruling, however, impedes the institution of such practices, and threatens water quality in the watershed. CBF sued the Virginia Department of Environmental Quality and the State Water Control Board over the passing of the Virginia Pollution Abatement Permit- a permit that regulates animal waste management for animal feeding operations. The permit fails to address the need for large livestock farms (i.e. 200-300 cattle) to put into place stream buffers and fencing that would keep livestock out of streams and rivers on these farms. (Please see this post from July 1). Without buffers and fencing, livestock can deposit waste directly into waters, and can erode stream banks, putting excess sediment into the watershed. The lawsuit, heard on July 9, was dismissed by Judge C.N. Jenkins. While CBF argues that free-roaming livestock can “apply” their waste directly to streams, the judge believes that application of manure can only refer to the spreading of waste by livestock farmers. This entry was posted in Policy, Virginia and tagged Agriculture. 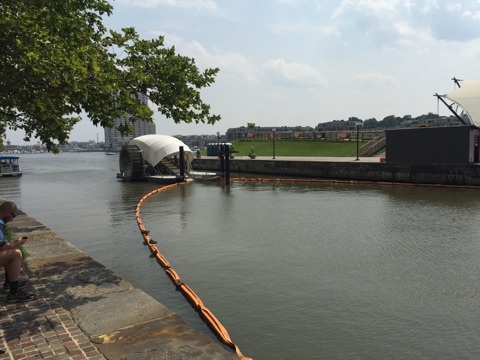 In Baltimore’s Inner Harbor an ancient technology is being used to clear trash and debris from its waters: the water wheel. 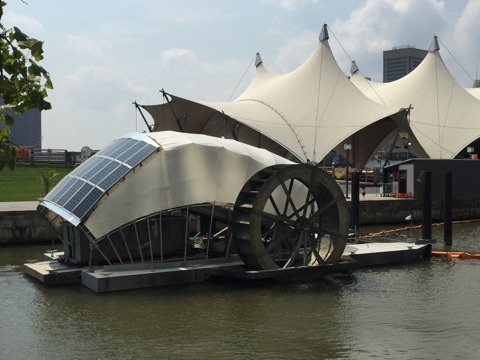 Situated where the Jones Falls River meets the Inner Harbor, the water wheel uses a combination of hydropower and solar power to scoop up cigarette butts, plastic bottles, Styrofoam, and other floating trash flowing down the Jones Fall River. The wheel, created through the Healthy Harbor Initiative, has proved remarkably effective, removing over 200 tons of trash since May 2014. This water wheel shows how even simple, small-scale projects, when successfully implemented, can achieve positive results in the Bay. Relying on hydropower from the river’s current, and solar power from panels attached on top of the structure when the current is slow, the water wheel combines a millennia-old technology with a newer, fast-evolving technology to remove trash and debris entering the Inner Harbor and ultimately the Bay. The water wheel powers a conveyor belt, which collects the debris into a floating dumpster. When the current is moving quickly after a storm, the dumpster can fill in a couple of hours. The water wheel has proved so successful that plans to add more water wheels throughout the Bay are under way. The water wheel was built by Clearwater Mills, LLC and owned by the Waterfront Partnership of Baltimore. Trash collected is then removed handled by the City of Baltimore Department of Public Works. For a news video feature on the water wheel, visit: https://www.youtube.com/watch?v=RkQbcrzyAeE. This entry was posted in Maryland.